When it comes to their facility, many property managers aim to create a safe, secure place for their employees and patrons. From daycares to coffee shops, every building is constructed to meet specific codes and standards set to minimize the chances of injury or death in the event of an emergency. Fire safety is one topic that has gained notoriety over the past year, as more headlines make the news with buildings and lives being tragically lost. One way that our drywall company helps to optimize the safety of your building is by installing drywall in the proper way, which can range from clearances for heat elements to installing fire-resistant (FR) products. As your top-notch drywall contractors in Chicago, AZ Drywall Finishing is proud to offer a plethora of professional services to Illinois businesses. Today, we’ll look into FR drywall and how it may be beneficial for your building. When you’re in need of a commercial drywall company that strives for perfection, be sure to contact our professionals for help! The construction of drywall gives it excellent resistance to fire due to the chemical makeup. Gypsum, which composes the center of your standard wallboard piece, is roughly one-fifth water by weight that is composed of various chemicals. Gypsum itself is non-flammable as well. When you expose drywall to fire, the water begins to release into the air as steam, which happens to be an excellent retardant for blocking heat transmission. Once the water runs out, though, the temperatures can begin to raise to the point where combustion and burning begin. While drywall is naturally resistant to fire, it is no safe bet in the event of an actual fire. Drywall contractors, architects, and designers need to account for each risk in the building and design the rooms accordingly. One area that fire and smoke can escape through is the gaps between gypsum sheets. Our professional drywall finishers can utilize tape and compound to effectively seal these danger points. Another way to increase the fire resistance of your building is to install multiple layers of drywall. Once the board dries out and the temperature exceeds the boiling point, fire can begin to spread. More than one layer, though, will nearly double the timespan of heat resistance. This approach makes sense, yet it is rarely efficient or cost effective. Gypsum drywall is resistant to flammability, but the structural integrity of the product is also vital to the safety and success of your building. Utilizing glass fibers in the composition of your gypsum can help to increase fire resistance while also improving the structural integrity of the board. Glass is not a flammable component and can therefore help to further resist the heat and subsequent moisture loss involved in a fire. Finding the right products for your building can be a tricky process. 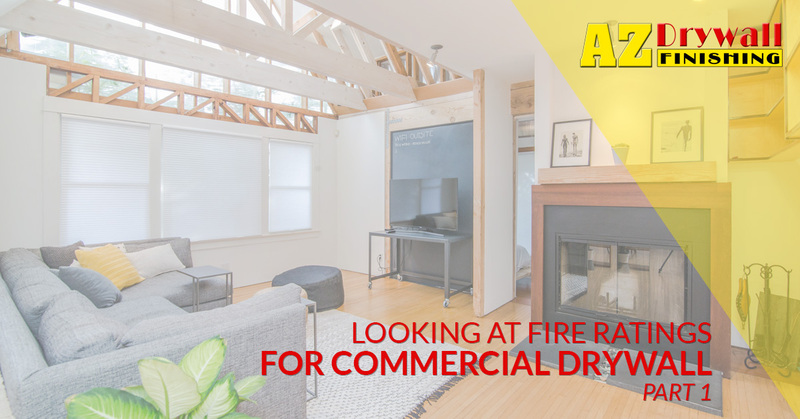 Next time, we’ll look into a couple different variations of fire-rated drywall that may be useful for your specific needs. As a team of experienced drywall contractors in Chicago, we have the tools and expertise to get the job done quickly, accurately, and safely. If you’re looking for quality drywall or insulation services, be sure to contact us today!